Political turmoil, ethnic tension and conflict have continued to engulf east Africa’s most populous nation, Ethiopia. The country is now on brink of an all-out civil war which could affect the whole region. Despite increasing international condemnation, the ruling party in Ethiopia has shown no sign of political reform. Instead, it continues to divide the nation once known for its unity and use all means possible to silence the entire population, estimated to be over 100 million. According to human right groups’ reports, from 2015 to 2017 only, more than 2000 protesters were killed and thousands were tortured while many were arbitrarily arrested. The 2016 Irreecha festival alone left over 1000 people dead and tens of thousands detained by security forces. And the regime’s killing, torture, arbitrary arrest and brutal measures have continued to intensify as protest and resistance continue to grow. Until recently, Ethiopia used to be seen as a stable nation in an unstable region. However, the regime’s draconian policies that target particular ethnic groups. discrimination, grand corruption, oppression, and widespread human right violations have led to widespread protest and political unrest, proving that the country is not different from other east African nations known for their decade-long civil wars. This has forced the international community to give at least some attention to the internal dynamics of the political turmoil. However, the international community has again failed to understand that the instability in this most populous African nation has far-reaching implications and that it is necessary to take action to prevent future disaster. The recent conflict in the south eastern part of the country in which the regime in Addis Ababa is implicated has shown the international community the true face of the regime and the future disaster it is sowing in this war-torn region of Africa. This conflict has shown us how the unrest has been changing its face over time. It is increasingly clear that the regime’s enforcement of its divisive policies are leading the nation to more trouble. In this new deadly clashes broke out last month between ethnic Oromos and ethnic Somalis in the country’s dry and mainly pastoralist south-east, hundreds of people are estimated to have been killed. Reports show that tens of thousands have been displaced following the clash. And the conflict has continued to intensify, affecting thousands of women and children. This and other ongoing political turmoil, ethnic conflict and tension are leading the country to endless and bloody civil war, posing a very serious threat to an already unstable region. Research findings also show an increase in militant activity across the country. This is one of the basic indicators used to predict large scale conflict or civil war. Margaux Pinaud is a researcher on political violence in Africa. In a recent interview, she stated that the militant activity is high, particularly in regions most affected by the protests, including Oromia, the largest region of the country. “Activity by ethnic militias in Ethiopia is the highest that it’s been since 1997,” she said. “And activities by political militias — though usually in unidentified armed groups attacking civilians or engaging in clashes with state forces — are also extremely high compared to the rest of the data that we look at,” she added. East Africa has long been an unstable region known primarily for war and drought. Any civil war that erupts in a country like Ethiopia will have spillover effects and has the potential to expand across the fragile borders of the region. The consequence of such large-scale unrest affects not only the region but the whole world. Ethiopia shares borders with six countries: South Sudan, Somalia, Sudan, Eritrea, Kenya, and Djibouti. All these nations are in political turmoil and conflict. Somalia, which shares the longest border with Ethiopia has suffered an ongoing civil war since 1988 that claimed the lives of hundreds of thousands of poor Somalis. Both north and South Sudan are not exceptions. It is estimated that the 1983-2002 ethnic war in Sudan had claimed the lives of nearly one million Sudanese; the recent ethnic violence in South Sudan alone has claimed 4,000 lives. The 1998-2000 Ethio-Eritrea devastating border conflict was another tragic war that resulted in a widespread loss of life, as well as injury and damage. A civil war in Ethiopia affects the region directly and the consequences are long term and difficult to undo in the future. Such conflict opens doors to terrorists, fanatic armed groups, and ill-intentioned foreign powers. And it makes the region a play-ground for these destructive forces. Some oil-rich Arabian nations have already begun their effort to add fuel to the fire. They are trying to establish military bases in the region and control this strategical geographic area. As we have seen in the past few years, terrorists are jumping into conflicts and exploiting them to achieve their goal: destruction and mass slaughter. And Africa is no exception. Many African counties are victims of these groups’ new strategies. Boko Haram in Nigeria, Al Shabaab in Somalia, ISIS and Al Qaeda in Libya, Jama’at Nusrat al-Islam wal-Muslimin, the Al-Qaeda linked jihadi faction in Mali are few examples of terrorist groups operating in Africa. And there is no guarantee to say the same thing won’t happen in Ethiopia. As the country is located in a strategic geographic area, the chance to become another Afghanistan and Iraq is high. The international community and regional institutions have been trying to make east Africa a stable and a safe place. 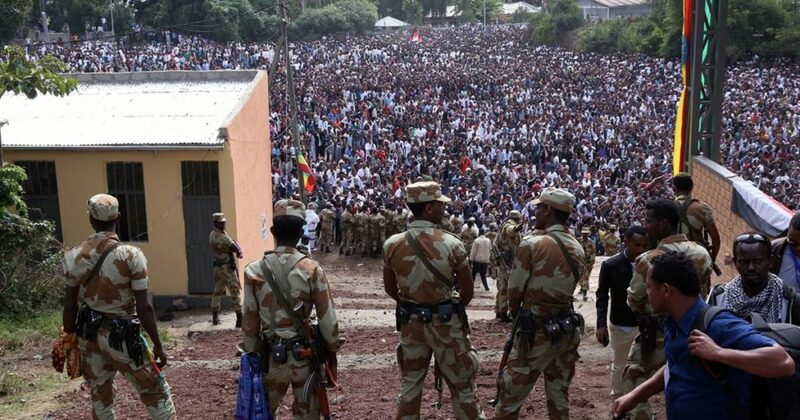 If an all-out ethnic conflict or civil war break out in Ethiopia, this on-going effort would immediately collapse and it would become very difficult to establish law and order in the region in the future. And east Africa would plug into another two or three decades of bloody war and unrest. As this is a drought- prone area, such a conflict would be catastrophic and would result in an even more dramatic humanitarian crisis. Ethiopia is one of the major allies of the west in the fight against terrorism and many argue that this is one of the reasons why the international community is doing almost nothing to force the regime in Ethiopia to make genuine political reform and avert the disaster-in-the-making. The international community still believes that the government in Addis Ababa is a key partner in improving the deteriorating peace and security in the region. This is a result both of wrong calculations and the shrewd politics of the regime in Ethiopia. The fact is, however, that the government in Addis Ababa is what is turning the nation into lawlessness. It is a terrible truth that the current stance of the international community is not making Ethiopia safe and the region stable. Instead, it is making the country less stable and increasingly unsafe. It is obvious that the west is silent not because they do not know what is going on in Ethiopia or because they like the regime. It is because they do not have another option at this point and are waiting for the right time to turn their back on the regime. No one doubts that the US wants to see democracy flourishing in Ethiopia. The question is, when will the US say enough to the regime in Addis Ababa. The clock is ticking. There is no more time for the international community to sit and watch this large scale conflict in-the-making. It is the time to say enough to the regime in Ethiopia. The security and stability of East Africa is crucial not only to the region but also to the whole world. Therefore, the international community should begin efforts to prevent this crisis from happening.